This baked egg dish is deliciously simple. 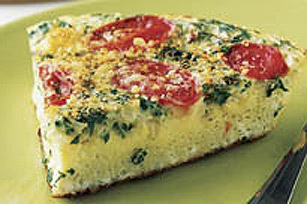 Made with onions, tomatoes, onions, Parmesan and a medley of fresh herbs, this egg frittata is perfect for breakfast, brunch, lunch or a light dinner. Beat eggs, milk, onions and herbs with whisk until well blended. Heat oil in 8-inch ovenproof skillet. Add egg mixture; cook, without stirring, 4 min. or just until set around edge. Top with tomatoes and Parmesan. Bake 20 min. or until centre is set. Let stand 5 min. Bake frittata as directed; cool completely. Refrigerate up to 24 hours. Reheat before serving.